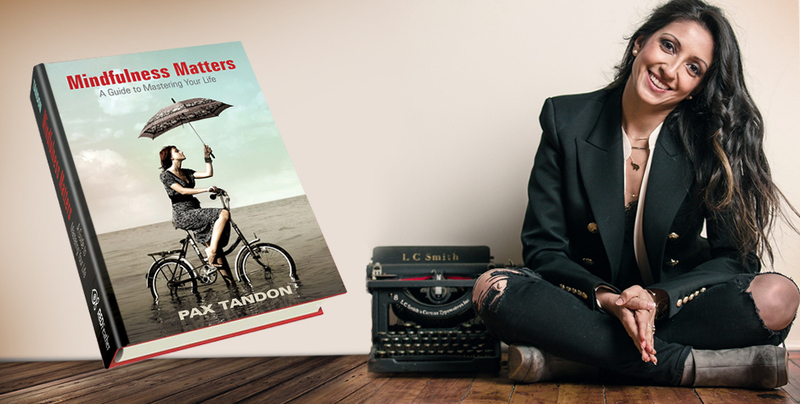 Pax Tandon is an author, producer, wellness advocate, and teacher. Her book, “Mindfulness Matters,” is on shelves and in palms now. She also recently finished work on a mindfulness short film, which she co-produced, co-wrote, voiced and starred in. Tandon holds a Master’s Degree in Positive Psychology (the scientific study of what enables individuals and communities to thrive) from the University of Pennsylvania. She earned a BSE from the Wharton School of the University of Pennsylvania and a BA in Psychology from the College. She also holds a Certificate in Applied Positive Psychology, a Certificate in Positive Psychology Coaching, 200 hours of yoga teacher training, and a certificate of training in Past Life Regression Therapy. She has extensive study and training in Mindfulness, having completed the Mindfulness Based Stress Reduction course through the University of Pennsylvania’s School of Medicine with Dr. Michael Baime, and a certificate in teaching mindfulness through the Mindful Schools organization. Tandon has given speeches, led workshops and sat on panels for countless schools and organizations, including The Wharton School, Drexel University, Cabrini College, The Baldwin School, the American Foundation for Suicide Prevention (AFSP), the Philadelphia Film Society, Women in Media, and The Fearless Conference, to name a few. She created a series of Mindfulness Meetups that were free and open to the public in Philadelphia and ran through 2015. Tandon continues to play a significant role in the television/media space, where her face and voice frequently appear in major publications and on various networks, among them CBS, NBC-10, Fox 29, The Philadelphia Inquirer, The Daily News, and others. She started her career as a teen personality on “Rap Around,” a show devoted to teen issues. She then served as an anchor and producer for CNCB-TV18. Other media projects included hosting a music show called “Spotlight on Bollywood,” and being a featured panelist and guest on several radio and TV programs. She has also been featured as the host and central role in 2 major network television pilots. She is passionate about using her voice in the media to effect lasting positive change. Tandon acts as Director of the Vivo-Forto organization, whose mission is to train all of the world’s children in mindfulness. She also sits on the board of Write Your Future, a non-profit dedicated to teaching writing skills to students most in need. She is an advocate for the AFSP, where she has played the role of Emcee for the annual “Out of the Darkness” Walk, which gathers thousands in memorial of those lost to suicide.